Recently, I was asked by a very dear friend to create a vivid memory painting for the 60th birthday of her brother. All the siblings chipped in to pay for this 16″ x 20″ oil painting, framed in Mahogany. 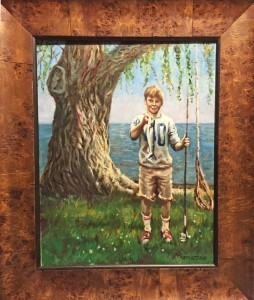 It was made from a compilation of several photos taken when Bob was a little boy, fishing in his lakeside home. There was a time when everything seemed crisp and new and perfect. There was a time when everything made sense. The water was clear and calm and the old Willow seemed to know me and envelope me. The world was full of possibility. As I return now, to myself, through the veil of time, I see that nothing was ever really mine. It is and was and always will be yours, dear Lord. And yet I give you now what I only seemed to have. Even my memories aren’t mine. The past is endless, as if it never really was. But I know it’s there, deep within the stare from the heart of this soul you always called your own, this skipping stone. Debbie Harvey liked this on Facebook. Is that the tree at the Harvey house on Lake St Claire? 60th birthday? What the heck. Beautiful painting though. Scott that’s great you remember the tree. Rob took 3 different pictures to position Bob by the tree and have the rope in the background. He is amazing. Bob was blown away by the portrait. and yes, Bob turned 60 is February!! I remember the tree from a family Phillips photo of our family sitting on a picnic table under the tree w Bob and Cathy Garypie when we were all little. yep! He hasn’t changed a bit. Donna Harvey Raphael liked this on Facebook. Wayne Camp liked this on Facebook.